Our growing season is just about over, and this is what our garden looks like after more than 4 months: a bit overgrown, kind of crowded (and this morning it's wet from overnight rain). For comparison, see 9 weeks, 5 weeks, and 0 weeks. We've managed to get a few red tomatoes this summer, although our most recent ones have cracked while growing. We have tons of green tomatoes of all sizes, with the medium and larger ones also cracked. Possibly they grow too fast? 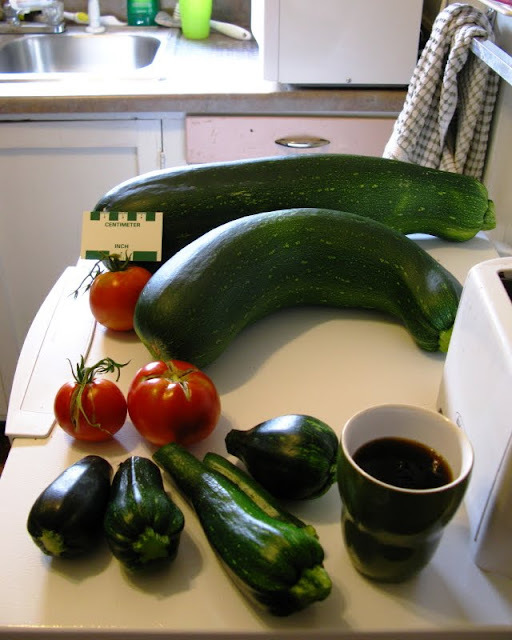 Our zucchinis got huge while we were away for two weeks - the scale in the photo has inches on the bottom, centimetres on the top. The zukes seem to either not grow large at all with rotting near the ends, or to grow fat, usually with rotting near the ends except for the two giant ones. Maybe we'll carve one for Halloween! Our Anaheim peppers have grown exceptionally well with zero problems, and a few have now started to turn reddish on sides facing the morning sun. The red kale looks good and has grown well. We stopped the caterpillar chomping of all the inner leaves by spraying water containing garlic and red pepper. Leaves we have eaten taste of garlic, and even the small ones take a long time to tenderize. A. Very. Long. Time. We'll try chard next year instead of kale. Date and time of photos: September 29, 2009, at 10:20 pm. Video created by The Sneer Review. It's not too late to vote for GrrlScientist, who blogs at Living the Scientific Life (Scientist, Interrupted). She's in the running in the Blog Your Way to Antarctica contest, and has been endorsed by many. Tomorrow is the last day to vote! Vote here! Vote now! It's not too late! More than a week ago, I left you with this enigma of an outcrop, which occurs at the base of some tall, brownish cliffs at the south end of Rainbow Canyon in Meadow Valley Wash. As seen before, the cliffs show crude columnar jointing. 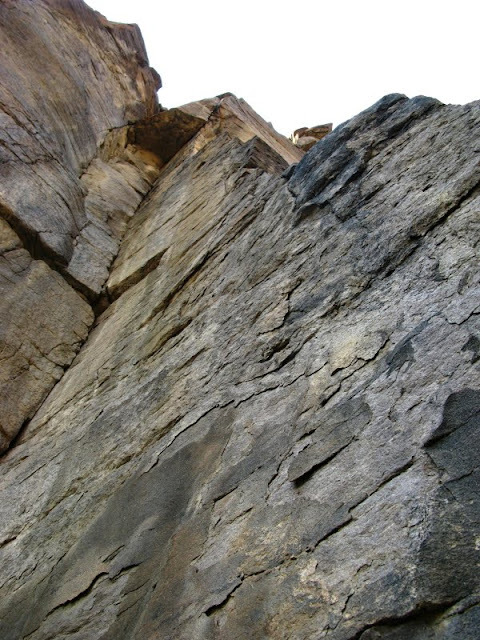 Columnar jointing is often well developed in basalt flows, and similar horizontal joints can occur in basalt dikes. We are in Nevada, however, where anything goes! Taking a closer look at the exposure at the base of one of the cliffs, we see a reddish gray rock with some kind of bedding or flow foliation. My finger is pointing at a lithic fragment. Just beyond the lithic fragment, we see a large, light gray, somewhat flattened pumice fragment. 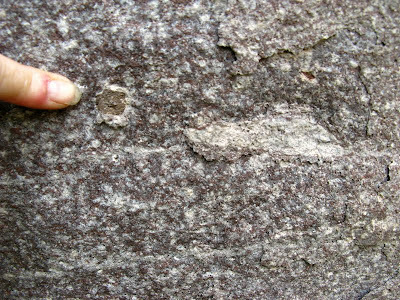 The layering in the rock, which is not really bedding, is from welding of this relatively crystal-rich, rhyolitic ash-flow tuff. The texture is known as eutaxitic, and it is the result of compaction during cooling and welding of the tuff. In this case, the tuff is moderately to strongly welded, not strongly enough to show consistent or strong fiamme as Andrew shows here. Looking straight up from the base of the cliff, we get this view. The rocks generally become lighter toward the top of the cliff and above our view, with welding decreasing gradually in intensity. The lighter color of the upper part of the tuff can be seen best in my first picture of these cliffs, from my first post on our 1978 camp in Meadow Valley Wash. In that month-ago post, when I described the rocks at the base of these cliffs, I answered last week's question! 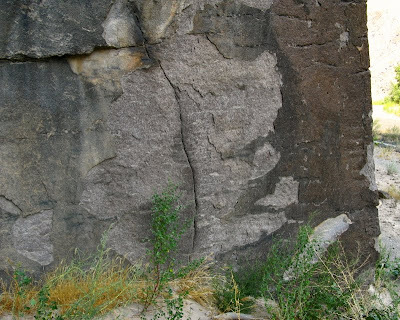 Large boulders of the lighter-colored, upper part of this ash-flow tuff have broken off and fallen from the top of the cliffs, and can be accessed easily along Highway 317. 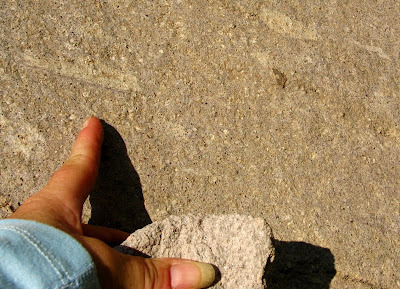 The upper part of the tuff - as seen in these roadside boulders - is moderately welded and shows compaction foliation (flattened pumice). The pinkish gray rock in my hand is a piece of this same tuff. Some of the larger boulders that fell from the upper part of the cliffs can be seen in the next photo. 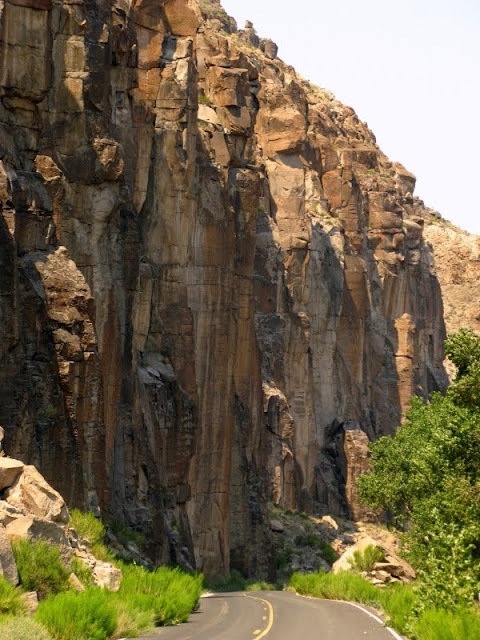 Columnar jointing is fairly common in the more strongly welded portions of some ash-flow tuff formations in Nevada; they are often dark brown, dark reddish brown, or dark orangish brown. These columnar-jointed welded tuffs can be confused with basalt from a distance - and the two rock types can even be confused up close if you haven't broken open a rock or two. After gaining some experience with this phenomenon, you may become confident enough to pronounce some dark volcanic columns capping a distant hill as either ash-flow tuff or basalt - but without having seen geologic maps of the area or walked over to the outcrop, even an experienced person can get it wrong. 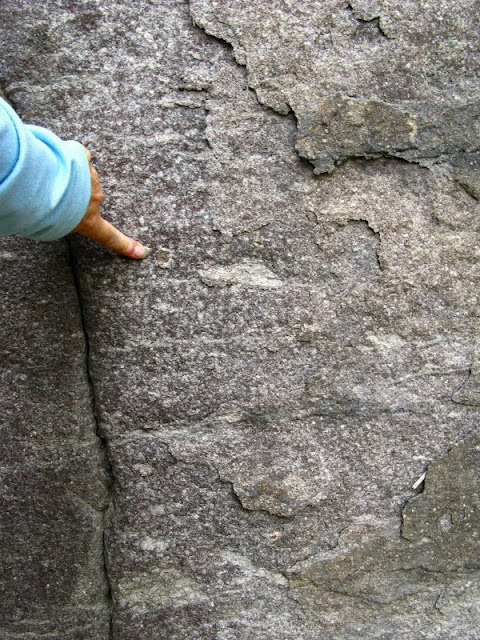 This ash-flow tuff is called Tt4 on this map. 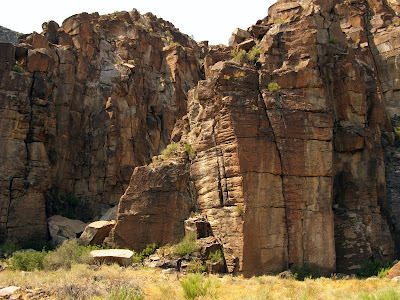 Tt4, which lumps several ash-flow tuff formations, is described here as including "poorly to densely welded, crystal poor, bimodal high-silica rhyolite and peralkaline ash-flow tuff and related airfall tuffs; gray, red, tan, and brown." The tuff in our cliffs is probably the 14.0 Ma tuff of Etna or the 12.6(?) to 11.4(?) Ma Ox Valley Tuff - dates are from Rowley et al, 1995. The Ox Valley Tuff is "a light-gray, crystal-poor, poorly to densely welded, high-silica rhyolite ash-flow tuff whose outflow consists in most places of one to four cooling units that generally total less than 40 m thick but may be as thick as 130 m" (Rowley et al, 1995). Note that this description of "crystal-poor" doesn't match our earlier crystal-rich pronouncement. The description goes on to say that the Ox Valley Tuff contains 30 to 40% phenocrysts, which seems more than crystal-poor to me, but phenocryst percentage in an ash-flow tuff varies with degree of welding, and we are looking at a relatively densely welded part of this unit. The most abundant phenocrysts in the Ox Valley Tuff are sanidine and quartz. Plagioclase, amphibole, and clinopyroxene were noted in decreasing abundance, with trace to minor biotite. About 75 m of tuff is exposed at our location, from the base of the cliffs to the base of the overlying basalt flows. 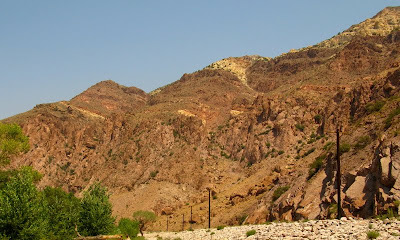 With the base of the tuff not exposed - or with it exposed in the canyon somewhere to the north - the tuff may be as thick as 100 m or more in this general area. 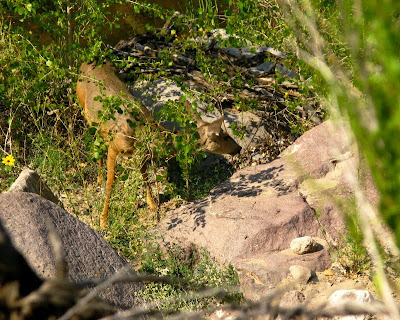 After dinking around at the base of these spectacular cliffs, I turned my sights on the trees lining Meadow Valley Wash and scared up a deer. I walked over to the running creek and got my feet wet once again. 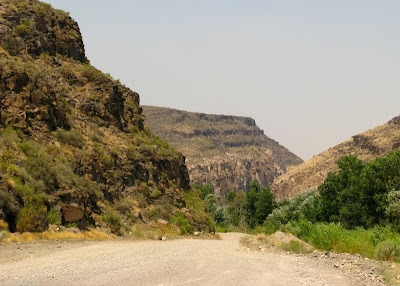 After cooling off in the shade, I turned back toward the cliffs, which stand like sentinels over the partly washed out road. 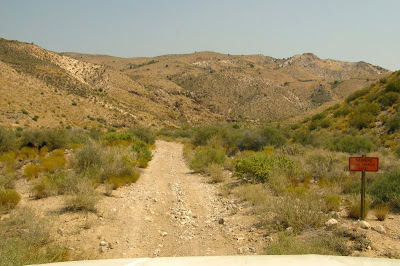 I then headed back to my truck to continue my drive north in Rainbow Canyon, north toward Caliente. Yes, we are finally back at our little house, back from being gone for a whole two weeks, traveling back and forth between Reno and the lake - back and forth, back and forth - more times than I care to mention. 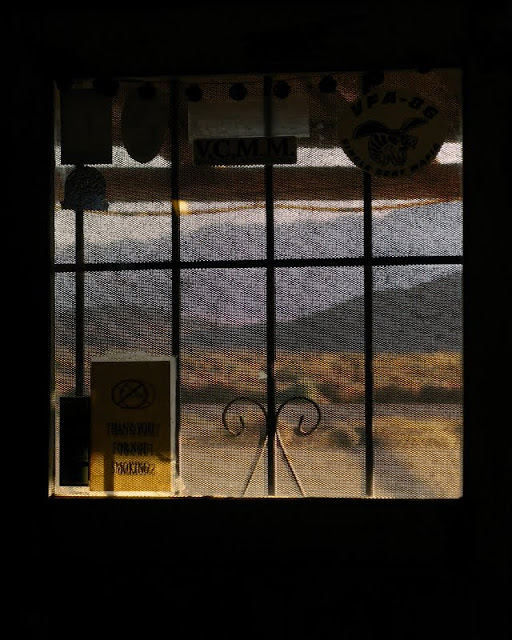 We stopped in Middlegate on our return; hence the photo, looking to the east through the window and screen door of Middlegate Station toward Middlegate The Place. My mind feels just about as clear as the hills and mountains look. The night before, Middlegate The Place, with the Shoe Tree visible through the notch, looked serene in the evening light, as the sun went down and turned the Desatoya Mountains red. Looking the other way, West Gate showed no sign of it's usual windmill, which was still lying on the ground waiting for repairs when we drove through. Care to make a phone call? We had great burgers, decent to good beers, and played a few uninspired games of pool. The usual Middlegate drama was taking place in the bar, though we heard only bits and pieces, off and on. 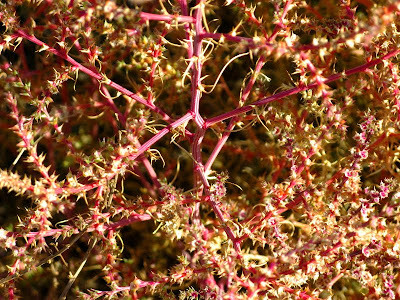 Above: Tangled, prickly, but still blooming (Russian thistle AKA tumbleweed ). 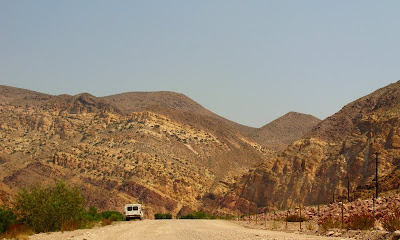 Prior to leaving two weeks ago, I had plans to visit yet another past field area in the next couple or three days, then non-finalized plans for side trips on the way to and from the coming GSA meeting. I have, today, been wondering about changing my GSA plans (once again) in order to make it to a poorly scheduled SEG field workshop on uranium deposits in Albuquerque, which would mean flying to Portland instead of driving, would mean leaving GSA two days early because the course overlaps with the meeting even though they call it "post-meeting," and would mean flying from Portland to Albuquerque and then flying back to some possibly nearby (or not) western airport. Or, instead of that, I could go to an expensive field course on copper deposits in Arizona, which conveniently follows - by several days so as not to be too crowded in time and place - the Northwest Mining Association Convention in December. The copper course is run by people who know what they are doing. (Not that the uranium course isn't, mind you.) I'll probably do the latter (copper). I'd need to sign up for the uranium course today; I'll need to sign up for the copper course by next weekend. Besides, the price of copper is holding; the price of uranium isn't. The sign said Middlegate, but where were we, really? 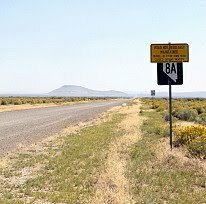 While crossing Eighmile Flat on our way to Middlegate, we were approached rapidly from behind by two flashing, wailing, Churchill County sheriff vehicles. They beat us to Middlegate by several minutes. Why were they there? Does anyone really know? Hopefully the answer will not be found in Stephen King's Desperation, which I am currently reading. Other questions need to be answered - will I stay one night with a cousin on my way up to Portland? Will I spend more than one night at the lake on the way? Will I make an Oregon detour on my way back? Or should I just blow all that off and fly up to Alaska for about a week. Maybe I'll just stay here and stare at a wall until I regain some internal mental composure. This road song is a new one for me, one based on an old Irish blessing - see this lyrics link for the blessing, and for all the lyrics - one verse is left out on this video version. This song is dedicated to R & R, who have both been in our thoughts much recently. 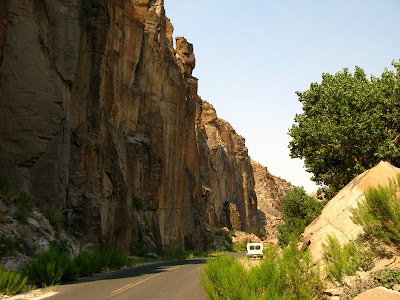 Here we're coming into the brownish cliff area on Highway 317, which I mentioned in my last post about Meadow Valley Wash - these are the rocks below the dark basalt flows. ...and tower over my truck. I wonder what these rocks are? The short weed-like plants (less than a foot high) are offered for scale - that's all you get for now! 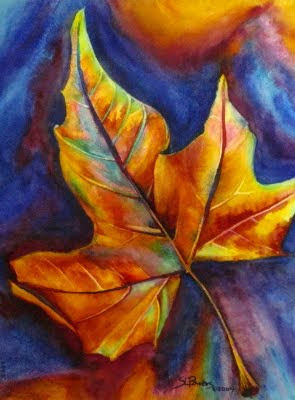 Golden Oak Leaf is part of a leaf series that I did several years ago. Many leaves were inspired by fall and fall colors, like this one, but not all were. Most leaves are now hanging at our lake house. It's barely fall at the lake. A Pacific-front storm passed through two days ago, bringing gloomy looking clouds, cooler weather, and a foggy morning or two. Leaves are barely turning: I've seen some red-orange to orange-yellow alder leaves and a few yellow aspen leaves. Summer flowers are, for the most part, finished blooming, though some poppies, purple cone flowers, and gaillardias are hanging on. I've been away from the computer quite a bit these past few days, and will be away, at least off and on, into next week, taking care of family matters. Posting may be erratic, depending on time and access to the internet. Original work Copyright © 2004. 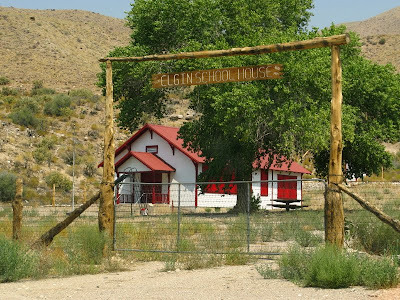 Elgin's main feature is the Elgin Schoolhouse State Historic Site, which is closed until Highway 317 can be reconstructed, maybe sometime in 2010 or 2011. 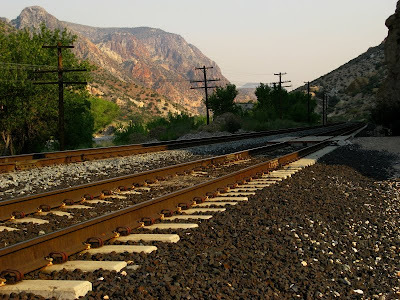 Elgin, NV is little more than a road junction and railroad siding, with a few nearby ranches. 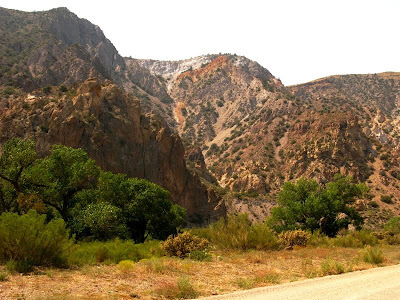 To get to Elgin, you drive south from Caliente on Highway 317 through Rainbow Canyon, then past the End of the Rainbow Canyon Ranch on the west side of the road, then east onto dirt at the Elgin turnoff. The paved Highway 317 continues south about a half mile past the Elgin turnoff, then it turns to dirt and becomes the Kane Springs Wash road. You can also come to Elgin from the south on the Meadow Valley Wash dirt road. 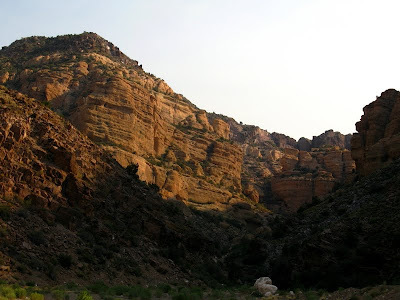 After driving north from the Cottonwood Canyon area, I made a short side trip a couple miles down the Kane Springs Wash road, but then blew off that portion of my explorations into the past in favor of Elgin and the more scenic Rainbow Canyon. 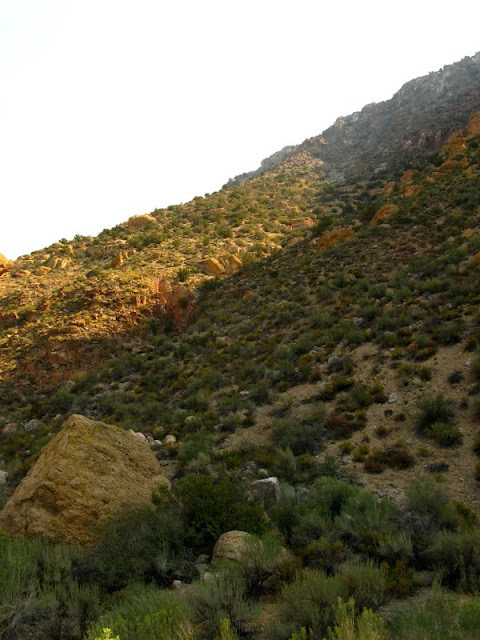 At Elgin, I turned east into the hills, thinking I could get into Pennsylvania Canyon, the site of some old exploration shenanigans, from the west. The sign says, "Road Damaged Ahead." At a V in the road just past the sign, I took the left turn, which is shown on old maps as the main road into Pennsylvania Canyon. The road immediately steepened and went around a curve. When I peered around the curve, I could see two more curves ahead, on a road with more curves and switchbacks than can be counted on two hands. The road looked damaged to me - lumpy and sloping irregularly off to both sides. I would have had to walk every single bit of the part of the road I could see, and probably much of road that I couldn't see, before being sure that I wouldn't have to back down around one or more curves if the road was completely washed out with no turn-around spots. Backing around curves isn't an impossible task, but it is one best done with a spotter, especially if the road is lousy. I backed up, backing around the first curve, turned around near the V in the road, and drove back to Elgin. I then headed north on 317 toward Rainbow Canyon. Highway 317 is marked at its north and south ends by signs like this one. Essentially, the road is subject to flash floods for 21 miles of its 21.5-mile length. 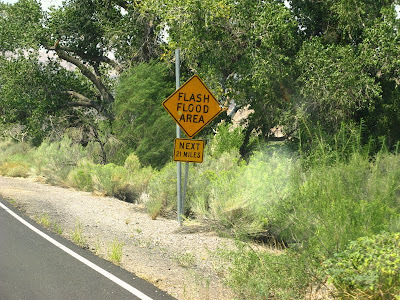 The flash flood sign was immediately followed by a closed sign. 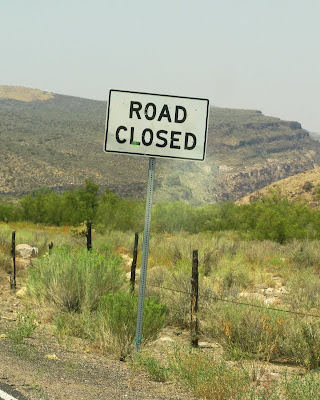 This closed sign is mimicked by a similar sign near the north end of the highway, near Caliente. The road wasn't closed by being blockaded, but in places it is practically wiped out, which happened during the 2005 flood. Locals say that the road hasn't been repaired since, though it looks like some dirt has been pushed around here and there. Rainbow Canyon's south end begins at this narrowing of the Meadow Valley Wash canyon, where some dark volcanic flows dip slightly to the south or southeast. These are those same dark flows in the foreground cliffs on the left. They consist of fine-grained to vesicular basalt or basaltic andesite. I call this part of Rainbow Canyon "the narrows," although I find no reference to that name on any map - it's either a local name, our old field name, or a name that stuck in my mind from somewhere else. Ahead, beyond the dark cliffs on the side of the road, you can see some lighter, brownish rocks underneath three dark flows of this same basalt. We'll look at those lower cliffs later. I did a lot of driving around during the two field days I was in the Caliente area, and one thing I did was to drive south on Highway 317, which goes one-half mile south of the turnoff to Elgin, NV. 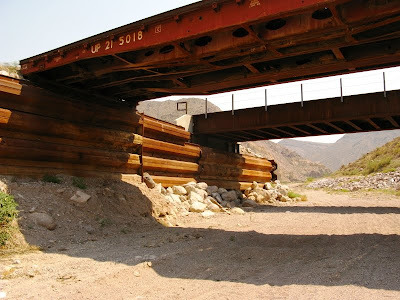 At Elgin, I turned and drove south on dirt toward Carp until I came to Cottonwood Canyon, shown here looking under the railroad bridge that crosses the canyon. 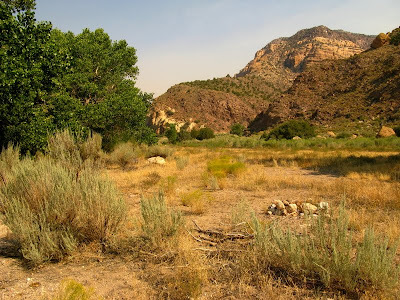 Cottonwood Canyon is part of a large drainage system that heads in the Clover Mountains at least 14 miles upstream from its mouth, and about 6 to 8 miles east to northeast of our 1978 camp area. 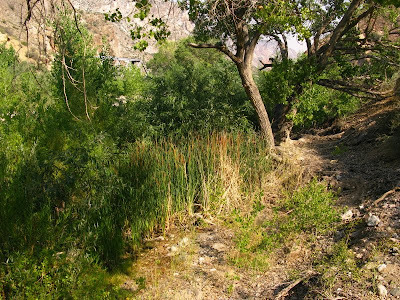 Upstream from its drainage mouth, Cottonwoood Canyon becomes Pine Creek, which becomes Ash Creek on one of its major side branches. Ash Creek heads in the mountains just east of Ella Mountain Lookout. Pine Creek heads in the mountains just south of the lookout. I did at least two helicopter-assisted traverses in this drainage, way back when. The first one involved being let off by the helicopter in the wrong place, which meant that we didn't know where we were for some time. It was one of our first drainage traverses of the summer. S and I walked the flowing stream together, thinking we knew where we were, until we finally came to a particularly stunning landmark - a major bend in the drainage - which was where we were supposed to have been let off. That was the last time I relied on the helicopter pilot to tell me where I was, even though he was an exceptionally good helicopter pilot. Prior to finding out where we really were, while in the higher reaches of the drainage, S and I drank some of the water. It was flowing along pretty good and was nice and cold. I don't recommend drinking random creek, river, or spring water in Nevada: cows are ubiquitous even if you haven't seen them. Fortunately we felt no ill effects. 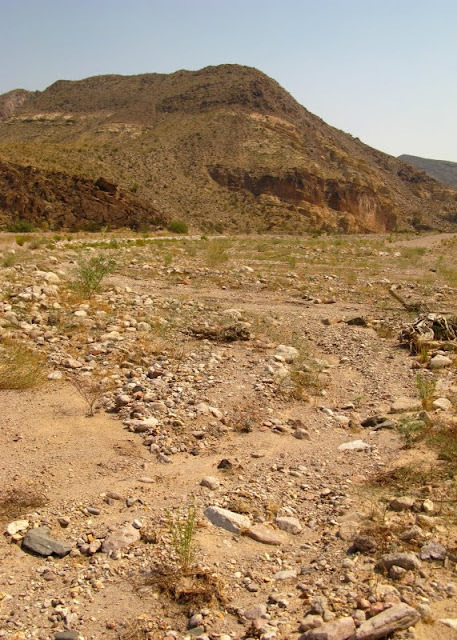 The lower part of Cottonwood Canyon consists mostly of a wide sand and gravel wash. 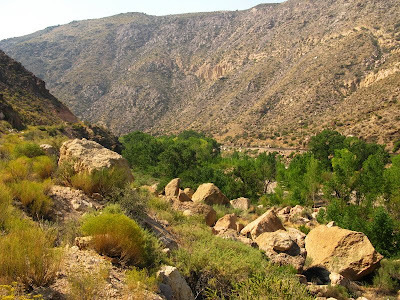 Besides doing that one traverse farther up the drainage, later in the summer I walked the lower part of Cottonwood Canyon. The sandy parts of the wash were soft and hard to walk through, even though I was walking downstream. 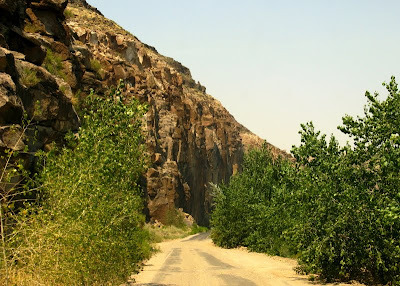 Because I was low on water before I came in sight of the bridge, I practised some Rules of the Desert while walking, by wandering back and forth between anything that even hinted at shade. Or maybe I wandered due to incipient heat exhaustion! The last little bit of shade, besides shade under rocky overhangs on the sides of the canyon, had probably been a mile or more above the end of the wash. This view, looking under the railroad bridge at the main canyon of Meadow Valley Wash, would have meant that I'd made it to the pickup point. I have no idea how long I had to wait there - maybe a truck had been left for me, maybe not. 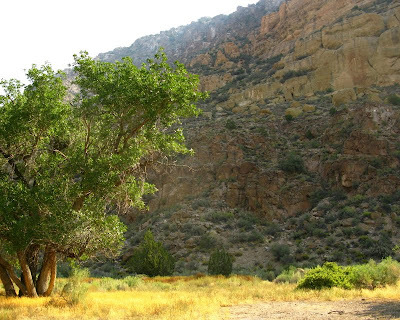 While in the area, I thought I would drive down to Carp, but Cottonwood Canyon was it. Maybe the heat of the day was getting to me. 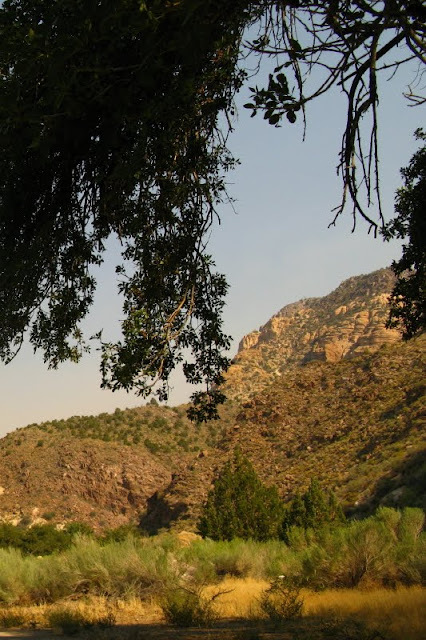 So, after spending a little time in the Cottonwood Canyon area, I turned around and drove north toward Elgin and Caliente. 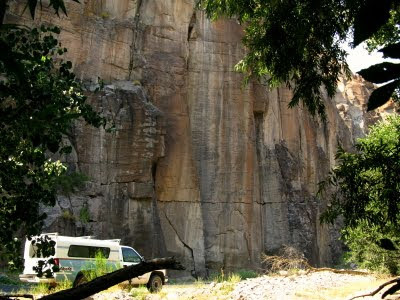 On my way to Elgin, I of course took a few pictures, mostly of the volcanic rocks forming the canyon walls. Above, a thick ash-flow-tuff sequence is seen looking north up the Meadow Valley Wash road from Cottonwood Canyon, with my truck for scale. 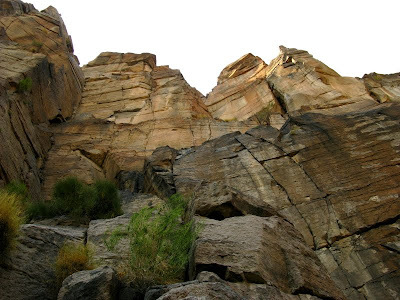 Meadow Valley Wash is a great place to see varied and variegated volcanic rocks, including a lot of ash-flow sheets that erupted from the Caliente caldera complex and the Kane Springs Wash caldera. 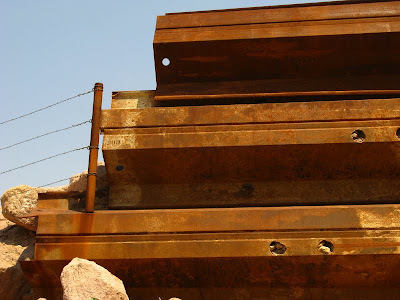 In the photo above, one can imagine that there is a fault offset of units going up the steep drainage in the center of the photo, with the offset appearing greater upward. The angle of the photo isn't great, and one has to contend with palaeo-topography, like old caldera walls and such, which may have created local unconformities. And, hey, we'll get to Elgin soon! The fuel-truck driver's antics diminished in import as the rest of the summer crew started trickling in to our Caliente camp in Meadow Valley Wash. We would have, when everyone finally arrived, two camps - L’s camp and G’s camp - and we would share the one helicopter between the two camps. Each camp would have about two weeks of helicopter-assisted recon work and about two weeks of ground work using trucks to get to mapping and sampling sites. As the crew trickled in, the second woman came into camp, giving me a little respite and some symbolic support: Norma, the second cook, who would cook for G’s crew. George did not like sharing camp with a second cook, especially a woman. He had his own way of doing things, and this own way of his became more and more eccentric as the summer progressed. Those of us in G’s camp would end up quite pleased that we had Norma and not George by the time summer was over. George was a meat-and-potatoes sort of cook, and he was from some old school where women did not cook in field camps. He would actually growl if Norma even came near. He fed us well, though. A typical breakfast from George was plates and plates piled high with scrambled eggs, bacon, sausage links, ham, hash brown potatoes, pancakes, cinnamon rolls, and toast and all the trimmings: butter, jams and jellies, orange juice, milk, coffee, syrups, fresh fruit like apples, oranges, and bananas, and - did I leave anything out? All this barely fit on the long table we sat around inside the mess tent. Dinner was equally bounteous: we always had more than enough to eat. As appetites waned during the course of a meal, George would go around the table telling everyone to eat up, insisting that everyone have a second or third or even fourth helping. He acted hurt if you did not take more, even though one or two helpings was usually more than enough. George was even known to take matters into his own hands and slap a large scoop of potatoes onto your plate if you had said, “No, thank you,” on his first pass around the table. “Damn it, I worked all day on this, now eat it,” he’d say as the potatoes hit your plate. George would not take suggestions from the hoi poloi - us - about what to cook. Norma did. She made pizza, tacos, enchiladas, and spaghetti as special requests, and anything else she could work out within the restrictions of a trailer kitchen and limited food runs to town. But this creative cookery of hers would have to wait until we split into two camps in June. George would have none of it. By the end of the first month, even the more meat-and-potatoes sort of guys were beginning to show signs of wear with his constant heavy fare. And no one would lose weight that summer, even though we worked strenuous ten-hour days in the sun and sage. The other camp, L's, had a long summer ahead of them - a long Summer of George. I would join up with them much, much later, at Bowman Creek. George would still be there. As I sat there beneath a tree that may have provided afternoon shade to my tent in that long-ago year of 1978, more stories came to me. 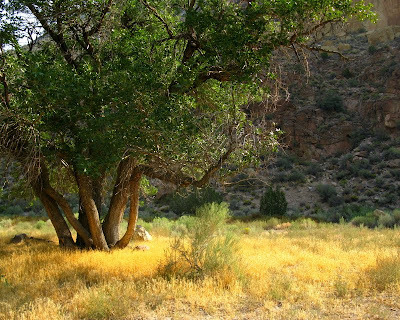 When we first set up camp in Meadow Valley Wash, about 14 miles south of Caliente, I was the only woman in camp. It was early in the summer field season - mid-May - before most of our college-student help was available. I was hired early. I was done with school, having successfully defended my Master’s thesis the month before. Three other young geologists were available for similar reasons, so we went ahead and set up camp, starting out with four young geologists, two off-and-on camp-boss geologists, one helicopter pilot, one fuel truck driver, and one cook. As the only woman in camp, I was the subject of some unwanted attention, but not by any of the geologists in camp. 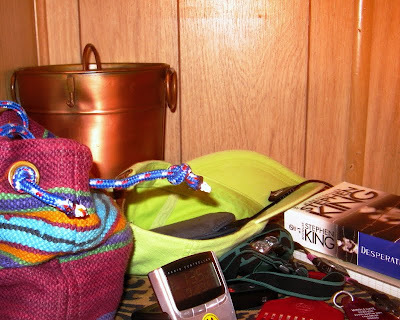 George, the short, grizzled, 78-year-old camp cook plied me with candy bars, which he hoarded in the camp refrigerator and gave out like the rare objects they were. Or, that is, he tried to ply me with them. I wasn’t much of a candy bar freak in those days, and though I constantly turned them down, he never really comprehended my lack of interest in his prized chocolate-covered treats, sure in his heart that all young women could not resist them. Other unwanted advances came from the fuel truck driver, a young, wild, ski bum who took odd jobs when he wasn’t at some mountain resort skiing. He liked to run around shirtless, the lower half of his body covered by the shortest of shorts. [I'm sure his attire wouldn't have been popular in certain quarters of the partly Mormon town of Caliente, NV, located just a few miles up the road.] He tried to get me to show some interest, but that just wasn't going to happen. He kept trying, though, and I kept saying no. He would ask me to mend his shirts and pants. He asked me to get coffee for him, from George. For some reason, he kept taking the approach of trying to get me to do things for him. L and G, the Western District head honchos, thought it was funny; I thought it was annoying. I was twenty-six years old. I have no idea, anymore, how old the fuel truck driver was; he was probably somewhere in his twenties, but his age was immaterial. His final ploy was to ask me to model a swimsuit he had supposedly bought for his girlfriend back home. He said he wanted to make sure it would fit her, and she and I were supposedly the same size. He kept coming to my tent about this. 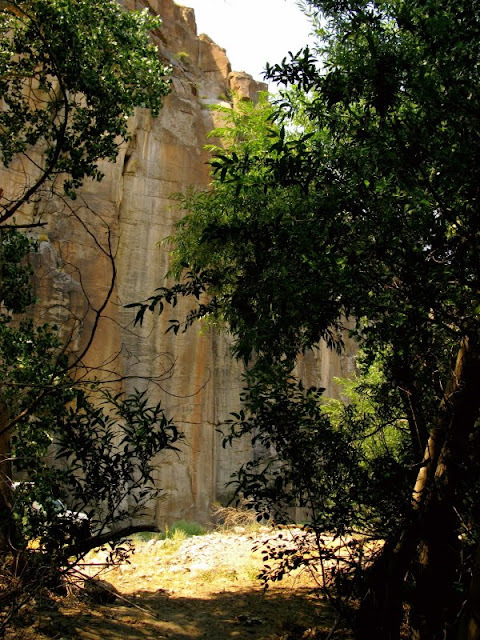 This was too much for me: I did not want him coming unasked to my tent, which was my refuge from all the people I ate with and worked with, my bit of privacy amongst the trees below the cliffs. L finally stepped in and told him to lay off. Thankfully, upon threat of losing a summer job, he did. 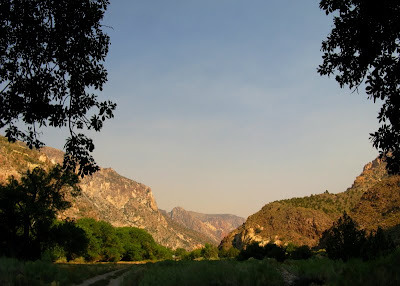 I finally decided on the most likely Caliente camp location, so I settled in and tried to find some signs of our occupancy in that long-ago time, the summer of 1978. The north end looked familiar, so did the middle and south ends. I couldn’t identify any historical signs, like things we had left behind, probably because we didn’t leave anything behind. The only possible signs I found of the old camp were pieces of charcoal, not necessarily located where we had our wood stove, but maybe, just maybe. Or maybe the charcoal had been left by hunters or other since-then campers. I’ve mentioned Bob Shannon before. As our “intrepid expediter, camp builder, and drilling arranger,” Bob was on hand when we set up the Caliente camp - our first camp of that first year - and he built all the camp accoutrements not hauled, driven, or flown in to every single one of our camps, that summer and the next. He saw to it that our eight-by-ten, six-foot-high, green canvas tents were floored with 4' x 8' sheets of plywood, which fit under the cots that held our individual sleeping bags. Each tent - except those of our camp bosses, L and G - held two cots for two tent mates. My tent was singular at first, but was doubled later when the whole crew, including the only other female geologist hired that summer, showed up. At Caliente camp, Bob constructed our first shower of the season, a sturdy and somewhat open contraption made of two-by-fours and plywood. Water came from a metal shower head attached to a 55-gallon drum propped overhead. Water went into the drum from a 200 gallon tank located far enough up hill from the drum to allow water to siphon into the drum through black hosing. Showers were often, but not always, warm or even hot, depending on the effect of clouds on our solar heating system. Cold water went into the shower drum in the morning to hopefully be heated by the sun. 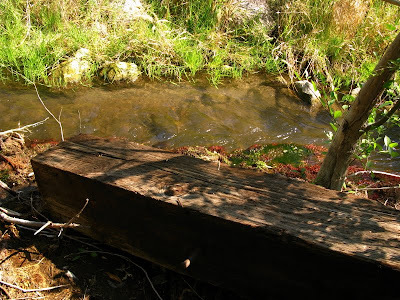 In some camps, our black tubing came from an uphill, creek-fed water source. Because of the long run of black tubing down the usually shallow slope, water in the tubing was heated by the sun during the day, and then added directly to the shower drum in the afternoon. The system worked well on most days through the summer. The water tanks - we had two, one for L's camp and one for G's - could, when empty, be wrassled around by one or two guys in the back of one of the two three-quarter ton pickups we had gotten especially for hauling the trailers and the heavier pieces of our camp gear: lumber, the refrigerator that came along after G found it at an old mining camp, and the 200-gallon water tanks full of drinking water. 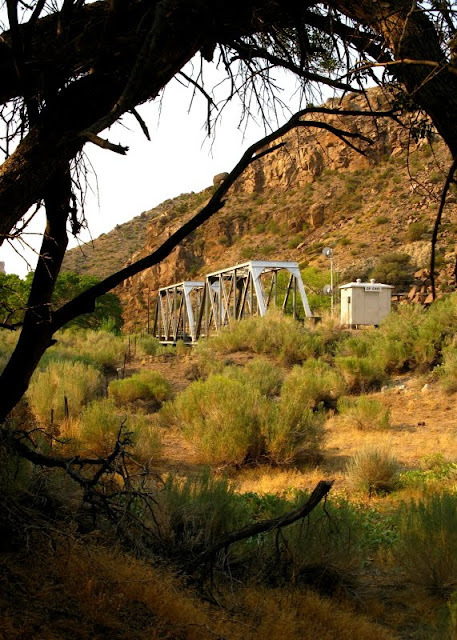 At Caliente camp, we filled our water tanks at a Caliente city water spigot. The tanks were made of thick, sturdy metal, and lined on the inside with a white plastic material. Every now and then, Bob would throw in some Clorox to sterilize the water, especially when new or suspect water was used. 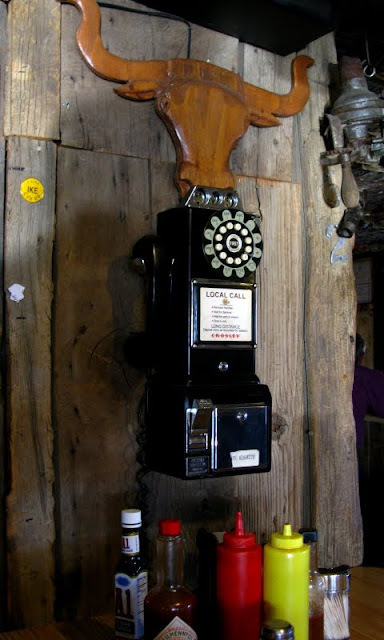 At the time, I had never heard of adding Clorox to water in order to give it the chlorination treatment so common in municipal and county water systems, but Bob was an oldtimer who knew all about such necessities. The two-by-four and plywood outhouse, built by Bob, was equally sturdy and as elaborate as the shower. Two holes were dug deep, the depth designed to last for the duration of each three- to six-week camp. I was able to avoid the latrine-digging and re-filling chores by virtue of my predetermined female status - I was never asked to participate and did not complain about being opted out. A two-seater sitting area with plywood back and sides for shielding was placed over the holes. 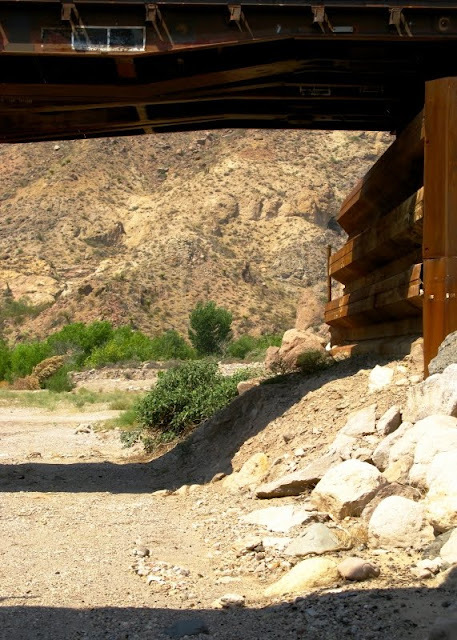 The door of the outhouse was an open entryway that faced away from camp and gave an unobstructed view of the local scenery, whether it was of hills, bushes, or valleys. 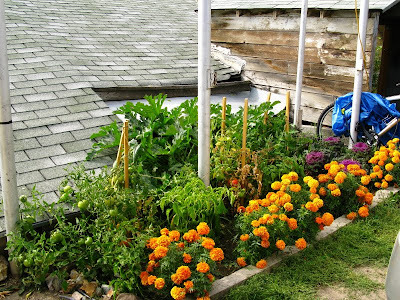 We arranged a flagging system to indicate when the outhouse was in use. Unfortunately, the view from above the outhouse was unobstructed. 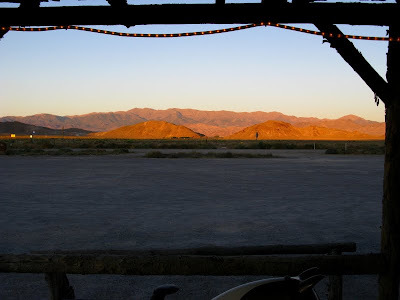 Occasionally, the helicopter pilot or one of its male passengers would get the idea that buzzing the outhouse or shower was in order, usually only if C, who would join us at the next camp, was inside. She did not take kindly to these voyeuristic flights, but somehow her anger only spurred them on. Fortunately, the guys got these wild hairs only infrequently, and equally fortunately, they were not perpetrated on me. 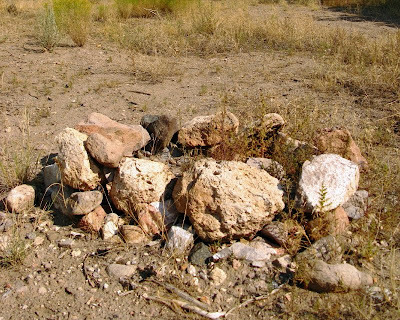 This most recent time that I visited Caliente, I did some more looking around the long-ago campsite from 1978. I wanted to make sure that I'd found the right site, and I wanted to take more pictures. In order to more fully evaluate the area, I drove the old camp road - which is the only road shown on the old topo map - south of camp to an unnamed drainage. I then walked the area south of that drainage. Later, I drove south on the main road and checked out an area where Meadow Valley Wash may have washed out some land sometime in the last 30 years (or even before then). With all this additional exploration, I still may have missed the area, but I don't think so. Air-photo sets from 1978 or thereabouts would be helpful. This area, south of the unnamed drainage, has a good, wide ledge above the river, which we could have camped on - but the view seems wrong, the drainage has a road in it - and I don’t remember a side road that close to camp - and the area is overgrown with cottonwood trees, willows, and high brush. I decided against it. 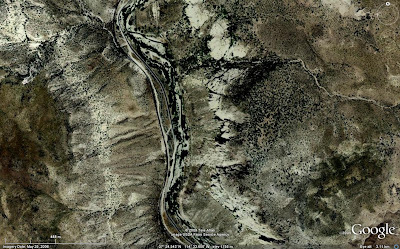 I then went farther south to an area where Google Earth shows three wash channels, including the active one - see the upper center part of the above GE image. 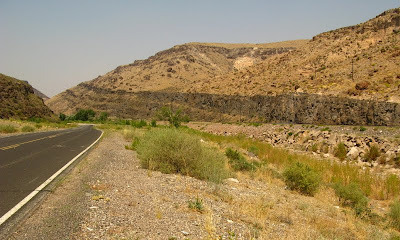 The active channel is against the far east wall of the canyon, where there is a raised ledge above the river, and where the main road is shown on the old topo map. 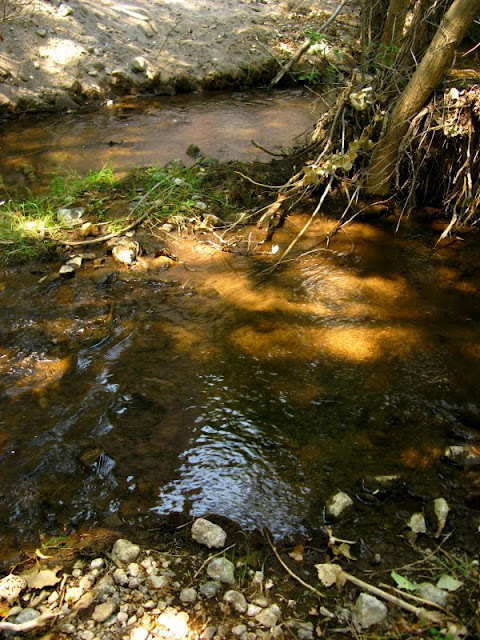 I crossed the creek here, after walking across two sandy, brushy, and tree-infested unused wash channels. I took off my socks, rolled up my pant legs, and walked through the creek (river?) in my field sandals. Later, having not put my socks back on, and having not rolled my pant legs back down, my legs were all scratched up from all the underbrush, and my feet felt a little misused. Boots or tennies would have been a better choice. I should have at least put my socks back on or rolled down the pant legs! 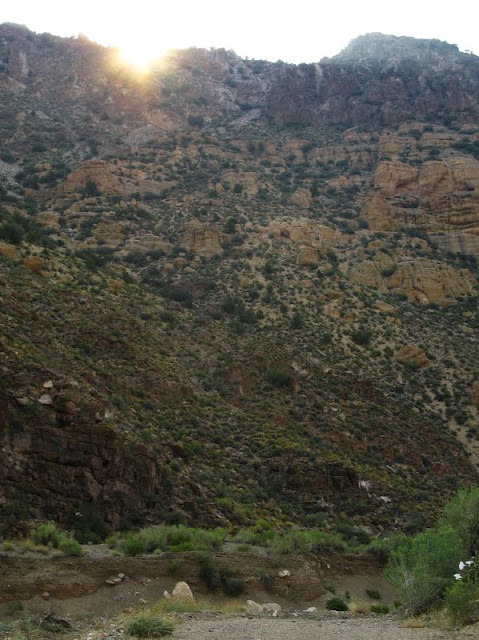 This is what the canyon looks like, looking south from the ledge where the old road used to be, with the train tracks visible on the west side of the canyon. 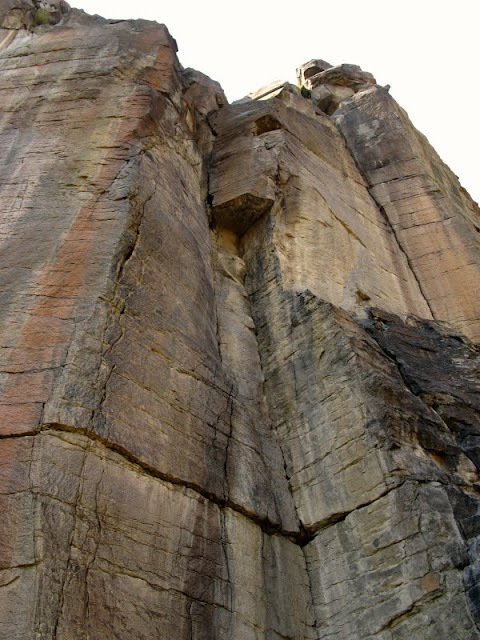 The ledge continues to the south towards the reddish cut behind the large, square boulder on the left. 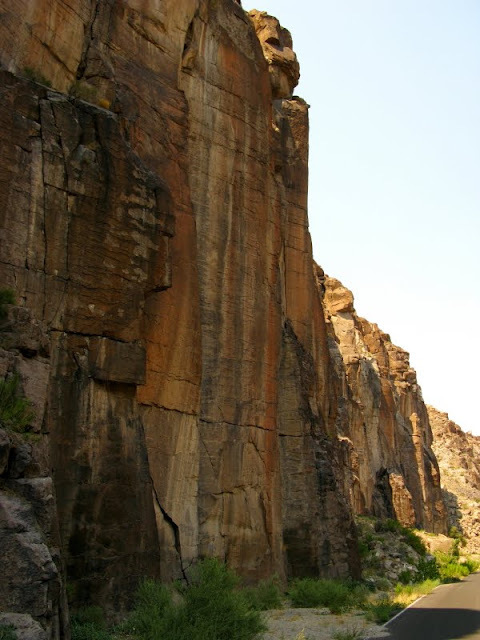 This ledge is not presently accessible by vehicle at all, has been covered by huge boulders that have rolled down from the cliffs above, and is higher above Meadow Valley Wash than our camp was. The cliffs behind the ledge are steeper than any camp cliffs I remember. It's possible, however, that I looked too far to the south and should have walked farther to the north, but I'm not going back anytime soon. 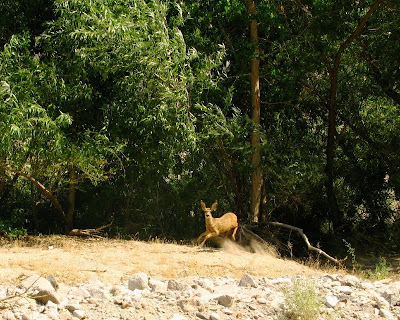 Because of the relative inaccessibility of the east side of the canyon in this area, and because of the dense tree cover along the active channel in general, I saw and heard lots of wildlife, mostly deer and birds. 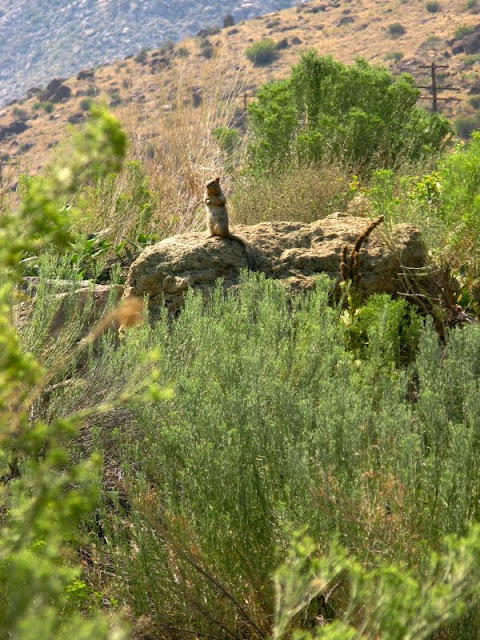 Walking back to my truck, after crossing Meadow Valley Wash again, I spied this ground squirrel sitting on a boulder of ash-flow tuff. So, back we go again to what I think is the most likely camp location. 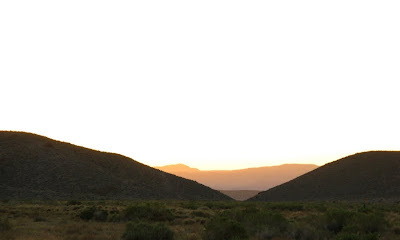 I arrived there fairly early in the morning, and this is what our view would have been near the north end of our camp area. Of course the cliffs of poorly to strongly welded ash-flow tuff look familiar - I have now been there twice in the last month! 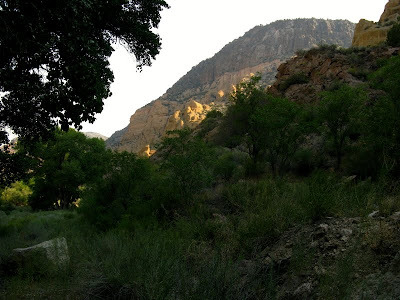 While the sun rose behind the cliffs, I putzed around here and there, walking back and forth and side to side in the wide area that was our camp, hoping that I might find some historical remains. I found signs of washouts and multiple realignments of the old road. 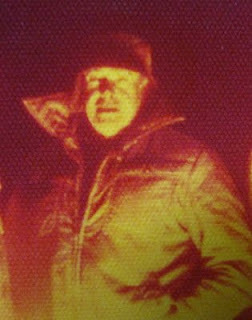 Back in 1978, we had accessed the camp from the south end; the area I’ve homed in on is now accessed from the north end. The southern access route may have been in the location of that unnamed drainage mentioned earlier. The railroad tracks and railroad bridge are accessible from the north end of camp, so I walked over and took a few pictures. 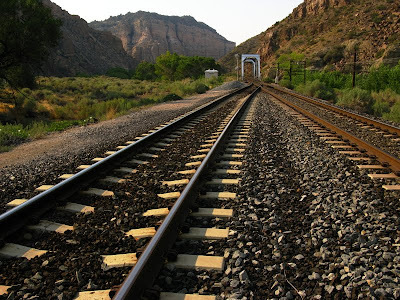 The view looking north along the tracks toward the reddish hills across the canyon from my first map area seemed vaguely familiar. Possibly I’ve been here before! If not, then I experienced a random feeling of déjà vu, rather than a meaningful one. 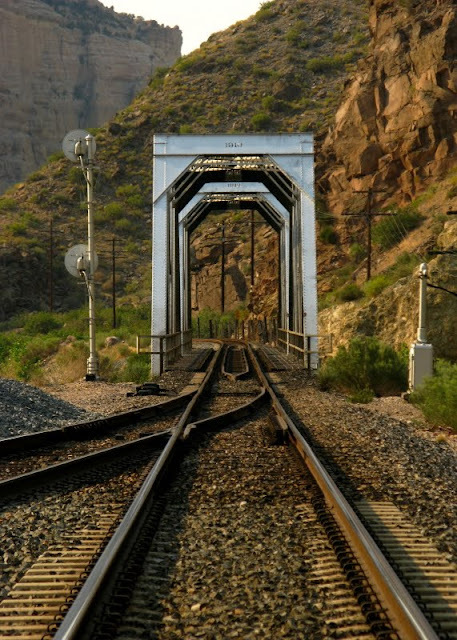 Here's the railroad bridge from the north looking south, with our camp area on the left (east) side of the photo.